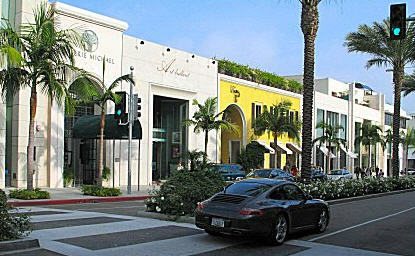 Rodeo Drive (pronounced "ro-DAY-oh") is a famous three-block long stretch of boutiques and shops in Beverly Hills, California. It is known as one of the most expensive shopping districts in the world. The center divide on this street was a horse path until the early 1950s, thus the name, but the shopping district as presently constituted developed in the 1970s. It is here that the rich & famous do their shopping, and where tourists window-shop while trying to spot movie stars on the fabled street (they almost always see one). Rodeo Drive is probably the single most famous, most prestigious shopping street on the planet, and it anchors a larger shopping district that is without equal. The most celebrated clothing designers in the world have boutiques here: Armani, Gucci, Christian Dior, Coco Chanel, Ralph Lauren, Valentino…The jewelry stores boast names like Cartier, Tiffany, and Harry Winston. On the North end of the street is , where Rodeo Drive Plastic Surgery is located. An outdoor center, its walkways and pillars are made of gleaming white marble, its brick walls are draped in ivy, and its polished brass railings overlook a sunken atrium courtyard topped by two glass pyramid skylights. There are five terraced levels of shops here: three below street-level and two above (we are on the second floor—Terrace Level). There is an open courtyard, where diners and coffee sippers sit on a sunny brick patio, surrounded by white latticework, trees, flowers, and a small waterfall. Designed with a clear European design and bustling with tourists and shoppers alike, ‘Two Rodeo’ is a unique and exclusive shopping center designed in the form of a Parisian-style street at the entrance to Rodeo Drive at Wilshire. In just the few short years it has been built, it has become a world-renowned shopping complex. Two Rodeo features an eclectic blend of restaurants, high-end beauty salons and services, and shops that cater to exclusive clientele and visitors alike. Rodeo Drive was the first place in California to implement diagonal pedestrian crossings (also known as "scramble corners") at some particularly busy intersections. The famed and historic Regent Beverly Wilshire Hotel sits on Wilshire Boulevard at the south end terminus of Rodeo Drive. 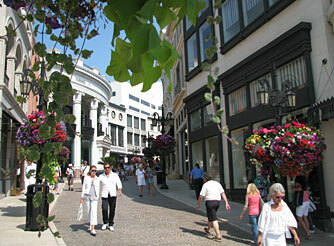 Rodeo Drive Plastic Surgery is located on Rodeo Drive in Beverly Hills, California. We have many patients from out of town and out of the country, whom we serve with our Visiting Patients Program. To learn more about tummy tuck in California and other plastic surgery and cosmetic surgery procedures like liposuction, breast augmentation or breast implants, facelift surgery, rhinoplasty, and more at Rodeo Drive Plastic Surgery, please contact us. You also can read more about our philosophy of California plastic surgery, and about what’s new at our Los Angeles cosmetic surgery center. Please also look at our photo gallery to see the results from our California plastic surgery treatments.